Winniepeg, a Canadian city, is the capital of the province of Manitoba. A major railway and transportation hub, the city has been nicknamed as ‘Gateway to the West’. Book a cheap domestic or international flight to explore this historic city which was founded in 1873. One important aspect of having a good time during your travels is eating good food. Go onboard a low cost flight to Winnipeg and enjoy a few meals with your loved ones at The Crusty Bun, Segovia Tapas Bar and Restaurant, Sushi N, The Red Ember and Baraka Pita Bakery. Canadian Museum for Human Rights- The museum is housed in a beautiful structure with modern architecture. Its permanent exhibits have been divided into different sections like ‘What are human rights?’, ‘Canadian journeys’, ‘Turning points for humanity’ and ‘Inspiring change’. Book a cheap flight to Winnipeg and visit this museum to acquire a deeper understanding of human rights. FortWhyte Alive- Spread over an area of 640 acres, FortWhyte Alive is a huge nature park with recreational facilities. Founded in 1983, it has many fun features such as a family treehouse, nature trails, forests and lakes. It is a great place for you to engage in skating, ice-fishing, bird-watching and other similar activities. Score some cheap airline tickets to Winnipeg and visit this picture-perfect soothing slice of nature. Assiniboine Park- Located along the banks of the Assiniboine River, the Assiniboine Park features lush lawns, a conservatory, a bike trail, playgrounds, sports fields, a zoo, the Assiniboine Park Pavilion and The Lyric Theatre. Royal Aviation Museum of Western Canada- Housed in a Trans-Canada Air Lines hanger (dated around the 1930s), it is the second largest aviation museum in the country. Grab some cheap plane tickets to Winnipeg to view the splendid aircrafts displayed there. A few of the popular ones are Avrocar, Lockheed Model 10 Electra and Fairchild Husky. Saint Boniface Cathedral- Standing tall at the center of the city, the Saint Boniface Cathedral, extrudes grace and spirituality with its impressive architecture. This Exquisite structure, a Roman Catholic basilica, is one of those places that brings a sense of peace to its visitors. 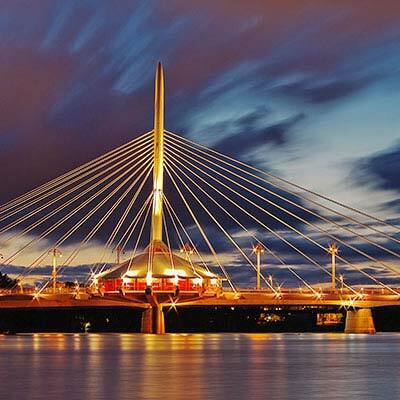 When you’re looking for Winnipeg flight deals, you’ll find that there are many airlines flying to Winnipeg James Armstrong Richardson International Airport. Some of the popular ones are American Airlines, Air Canada and United Airlines. Be it last minute flights or one way flight deals to Winnipeg, go through our travel portals to find the offers you desire.